Eli has always had two ways for writers to submit text: either files uploaded to Eli from a local computer, or using the WYSIWYG (what you see is what you get) editor to compose text directly inside Eli or to copy from another source (Microsoft Word, Google Docs, etc) and paste into Eli before submitting. Pasting text into Eli’s WYSIWYG editor is usually easy, but sometimes formatting doesn’t transfer correctly or garbage code comes with the text that makes the writing look different than intended. 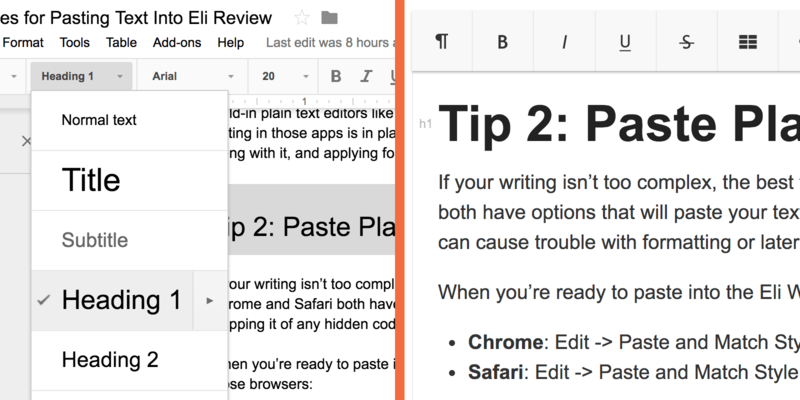 These tips for copying and pasting into Eli can save a lot of time and frustration when bringing text into Eli Review from other apps. Apps that use WYSIWYG interfaces often result in a lot of hidden code piggybacking on your writing when you copy your writing and paste into a different location – not just into Eli Review, but into other apps, too. To get the best results when pasting, we recommend writing in Google Docs, which generally produces web-friendly text, or build-in plain text editors like Notepad or Wordpad on a PC or TextEdit on a Mac. Apps that manage your writing in plain text, without having to store info about font size, color, etc, make it possible to copy and paste into Eli with no hidden code piggybacking along with it. Once it’s pasted cleanly into Eli, styling can be applied very easily. Chrome and Safari both have options that will paste your writing in plain text while removing the formatting and stripping it of any hidden code that can cause trouble with formatting or later with feedback. You’ll have to go back through and apply (or re-apply) styles and recreate your markup (headers, lists, links, etc) but this can save lots of time compared to trying to fix funky formatting that can come through Word, Google, Box, etc. Appearances can be deceiving when writing in a WYSIWYG. Something might look like a header by pumping up the font size or changing the color, but that doesn’t mean that Word, Google, Eli, or any other editor will recognize it as a header, different from regular text. If you use the semantic formatting options in your writing app to create structurally accurate headers, paragraphs, lists, etc, it’ll be much easier for Eli (or anywhere else you copy/paste) to know how that text is supposed to be formatted. Even if you follow all of the previous three tips, be sure to manually inspect your text and make sure it’s right before you submit it. The nature of writing (and writing for the web specifically) mean that formatting issues can occur even when you do everything perfectly. Do yourself a favor and double check that everything looks right after you paste your writing into Eli’s WYWIWYG and again after you submit it. If it doesn’t look right after you submit, you can go back and make changes, as long as the due date for the task hasn’t expired. Bonus Tip: if you turn your work in early, you’ll have time to fix its formatting, if needed. Another good reason not to procrastinate!